We Can Meet Our Lord Half-Way, but We Can't Stay There. The First Saturday of the Great Fast; the Commemoration of the Miracle of Saint Theodore; and, the Feast of Our Holy Father Martinian. • II Timothy 2: 1-10. • Mark 2: 23—3: 5. 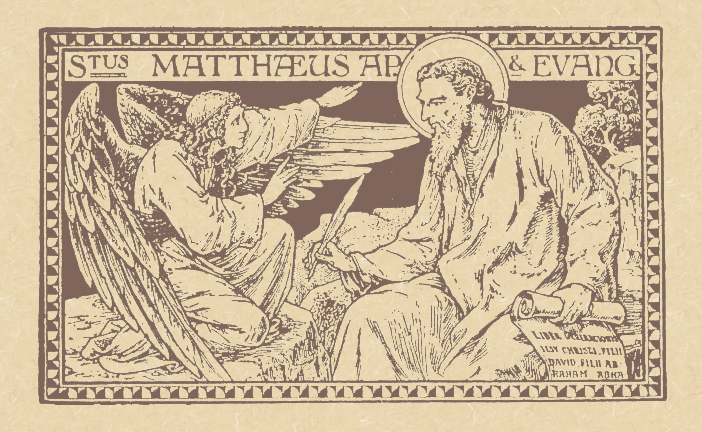 9:07 AM 2/13/2016 — Today's Gospel lesson introduces us to Levi—later called Matthew—and how he quickly responded to our Lord's call. There are a few of these episodes in the Holy Gospel in which our Blessed Lord is gathering around Himself His first disciples: He comes upon people of whom we've not read before, calls them to follow Him, and, without saying a word, they get up and go. I remember hearing a homily in college on the call of Simon and Andrew wherein the priest tried to tell us that, because the Gospel doesn't tell us everything, we can presume that Simon and Andrew had already known our Lord for some time before He called them, so they weren't simply following Him blindly. I'm not sure why he found the concept of following our Lord blindly offensive, especially as that's what makes the episode meaningful. In fact, I think it's likely that Jesus called a whole slew of people to follow Him in the early days, and the Evangelists tell us about those who actually responded, with an emphasis on those who responded immediately and without question. If we compare the call of Simon and Andrew to the call of Levi, we notice that, in both instances, these men are busy at their jobs when our Lord approaches them; the one difference is that, in the case of the two brothers, the job at which they work is rather innocuous;—there are no moral or political implications to being a fisherman—but, in the case of Levi, his position as a customs official and tax collector adds a new dimension to his call: he's a hated man. We can relate to this: some Scripture translations call these men “publicans,” that is, public officials; they were hated because, just like they do today, they lived rather high off the hog, profiting from their offices by means of the taxes they collected from their fellow Jews on behalf of the Romans. In fact, in the minds of many Palestinian Jews, they were traitors, since they were working for the enemy. That's why the Pharisees were so scandalized by our Lord wanting to call Levi. 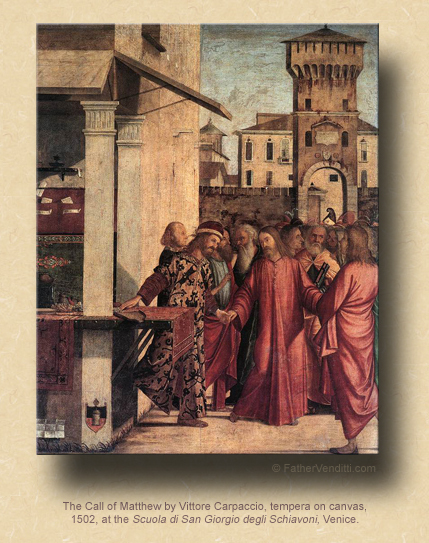 Levi, of course, responds very generously to our Lord's call, and shows his gratitude by throwing a party. The reason for his joy at being called by our Lord we may never know, but I tend to think that, like most people who spend their lives scampering after worldly profits, he's found that everything he's accumulated has left him empty inside. The last thing our Blessed Lord would want is a fancy banquet, but He goes anyway, because He's willing to meet Levi half-way. Levi may have responded to our Lord's call immediately, but his conversion of heart is in no way complete, which is why he thinks that offering our Lord a material reward in return for his call is a good idea. Our Lord accepts it because He's willing to take Levi where he's at. He's not willing to leave Levi where he's at, as we know; but, at least for now He takes him as he is, and this is what the Pharisees and Scribes didn't quite understand. Our Lord's response to them is as familiar as any verse in Sacred Scripture: “Those who are well have no need of a physician, but those who are sick” (Luke 5: 31 RSV). The Vulgate gives the best rendering: Non egent qui sani sunt medico, sed qui male habent—“They that are whole need not the physician: but they that are sick,” the translation coming from the Douay-Rheims. As we plunge headlong into Lent, and challenge ourselves to reform our lives, we are not only consoled by our Lord's words as they apply to ourselves, but they inspire us to regard those around us with increased charity. Those we meet along the way may not be where they should be—or where we think they should be—on their own journey toward Christ; but, assuming that we're not fooling ourselves regarding our own progress,—which is always a possibility—if our Lord is willing to take them as they are, at least initially, than so should we. After all, one does not inspire conversion in others by berating and lecturing them, but by befriending them and encouraging in them a desire to change. If Jesus had looked at Levi collecting his taxes and said, “I'm not interested in him; he's not what a want,” then the Church would have been deprived or a great Apostle and an entire Gospel. As the first half-week of Lent draws to a close, let us appeal to our Blessed Lord to help us encourage change in others by an increase in the practice of the virtue of charity. * Today is what the Missal refers to as "The Saturday after Ash Wednesday." Cf. the post here for an explanation of how the days of Lent are identified on this site. ** The lessons from the menaion are for the Martyr Theodore, whose miracle is always commemorated on the First Saturday of the Great Fast.